dead flowers in my windowbox – jen wewers, m.div. If I were opting for a more controlled and managed reading experience I would not likely put these two posts so close together. But I am about as far from controlled and managed as I could be right now. So let’s get to my dead flowers in the window box and how that is a sign of my mom. This is the anti-rose of sharon post. Here we will stay in the realm of the literal and the concrete. Well, not so literal that dead simply equals dead, but we aren’t going to be too much more complex than that. 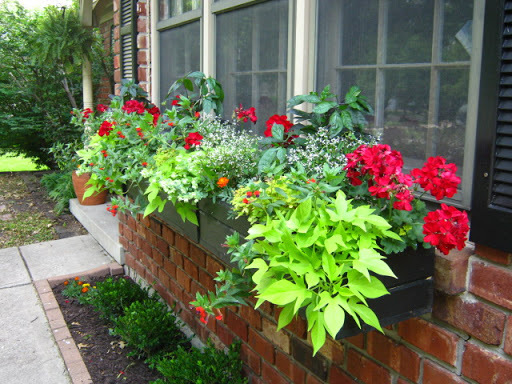 The goal for my window boxes this year – lush and abundant. My helper at Soil Service (best garden center and nursery in the world! ), tried to gently inform me the size of my window boxes would never be able to achieve lush. I guess size does matter in some things! I was encouraged to buy bigger boxes. They just happened to have them on sale and three were left. Sign number one: my mom wanted me to have lush window boxes. I had lovely window boxes. I went back to Soil Service and had two boys help me this time. Not unlike the Starbuck Barristas these guys had no idea how much they were helping a sad daughter missing her mom. See every year mom and I would be the first to buy flowers. We traversed everywhere, but loved Larry’s Nursery in the Walgreen’s parking lot, more than any other, for our annuals. This year I just couldn’t go to Larry’s. Instead the Soil Service dudes helped me choose the flowers for my robust and fecund window boxes. They recommended and I bought: ornamental peppers for height, diamond frost for show, sweet potato vine for reliability and color, bat face for interest and the ever present, red geraniums. Okay, I am not a fan of the geranium. Even the blood red ones. When mom and I shopped she always got blood red, not orange red geraniums. Not sure if it was the smell, the constant dead-heading or the “uncreative” nature of them. I always felt a bit like I was giving up when I bought them. Seriously, I told him, red geraniums? But something in me decided to surrender. So I bought a flat of them. Sign number two: my mom wanted me to have red geraniums. Not bad, huh? and the red geraniums were the centerpiece. I loved my window boxes this year. Everyday I pulled into the driveway loving them. I watered and fed them. Cared for them and the new baby boxwoods underneath. And a four week heat wave. Sign number three: I am my mother’s daughter when it comes to late summer gardening -I don’t do it. Okay, when my mom would annually stop watering, my dad would pick it up and usually managed to keep most things alive. He always knew – come August flower watering duty would change hands. By that time mom had started to plan her autumn window boxes. In my house, I live with two city boys (as my son continues to remind me when I have to bait the fish hook, release the fish, or pick up dead mice on glue traps). I guess I assumed they would help keep the flowers alive since that is such a deeply ingrained pattern I grew up with. Not so in the McKnight “city boy” house. Not even close. Yesterday I pulled them out and planted my fall window boxes. Purple mums, ornamental kale, and white snapdragons. I will toss a few brightly colored gourds in there once they sell them at the store. And today it will be 75 degrees. Perfect flower tending weather. At least for my mother’s daughter.